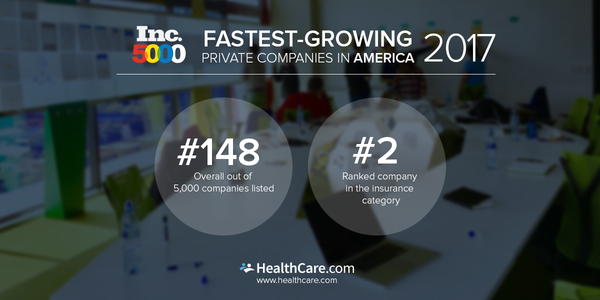 HealthCare.com Rises to #148 Spot on the 2017 Inc. 500 List of Fastest-Growing Private Companies in the U.S. This is the second consecutive year that HealthCare.com has gained this recognition, rising to #2 in this year’s insurance category. 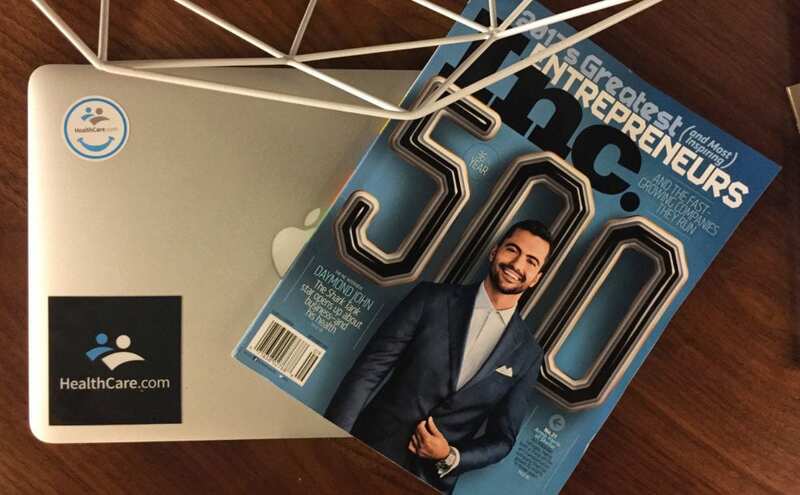 Miami, FL and New York, NY (August 16, 2017) – Inc. Magazine today announced that HealthCare.com has been recognized in the publication’s annual Inc. 5000 ranking of the fastest-growing private companies in America. 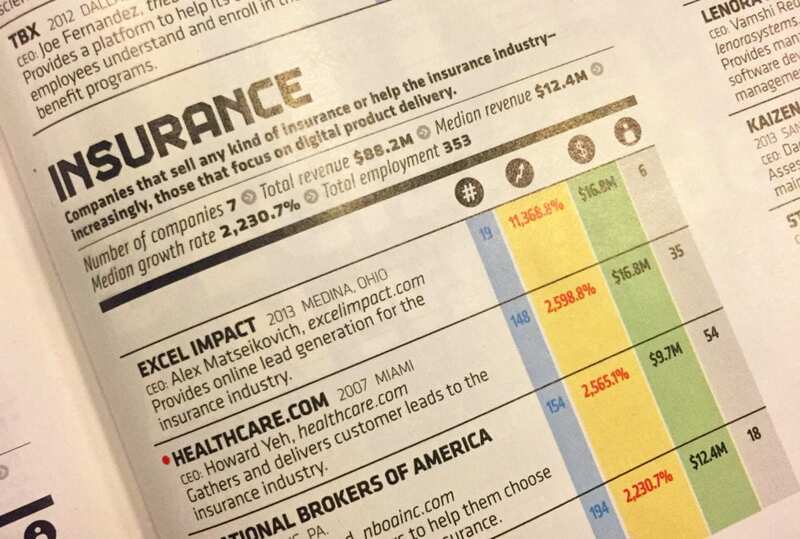 The company takes home #2 in the insurance category and stands at #148 overall, once again placing it in this year’s smaller and more elusive cohort in the Inc. 500. This is the second consecutive year that HealthCare.com has ranked in both the Inc. 5000 and Inc. 500. HealthCare.com is a leading privately-owned, search-and-discovery platform that helped more than 2 million consumers find health insurance last year. In 2016, Inc. 5000 ranked the company #388 overall and #6 in the insurance category. Earlier this summer, the company launched its foray into online content with The CheckUp, an online publication that informs and educates American consumers through tips, analysis, and news on healthcare. The company has grown its staff from 35 to 42 since the beginning of 2017, with plans for additional expansion in the coming months. HealthCare.com’s rapid growth indicates that consumers remain proactive in researching and buying affordable healthcare options. HealthCare.com is a privately-owned search-and-compare health insurance shopping platform that connects consumers with its network of licensed insurance brokers and insurance carriers. The website’s origins can be traced back to 2006, but launched as a new company in 2014 as a technology- and data-driven platform to help the American consumer efficiently compare health insurance costs and subsidies. HealthCare.com currently serves the individual health insurance market (including both ACA and non-ACA plans) and the senior market with Medigap and Medicare Advantage coverage options. In 2016, the company helped more than 2 million people find healthcare coverage. HealthCare.com completed a Series A round in October of 2014, raising $9.5 Million, led by PeopleFund and current and former executives of The Priceline Group. The company has offices in New York City, Miami, and Guatemala City. For more information, visit www.healthcare.com.